We’ve got just the cocktail to enjoy with friends while soaking up beauty-fall afternoons. 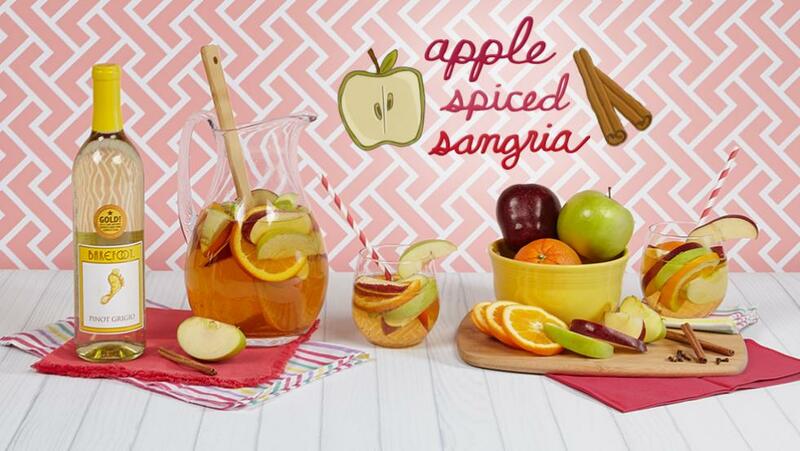 It’s fun, festive and serves up all the flavors that give fall its claim to fame. And if you really wanted to get in the spirit of the harvest season, you could even head out and pick your apples right from the tree. The hardest part of this recipe is waiting for it. Because it’s really as simple as combining the first 8 ingredients (everything but the ginger ale) in a pitcher. Then cover with plastic wrap and place in the fridge for 4 hours. If you don’t mind a few spices bobbing around your drink, fill glasses with 4 ounces of your sangria mix, and top with ginger ale and your favorite straw. For those who prefer a less cluttered cocktail, strain out the spices through a sieve. But, don’t forget to drop those delicious Barefoot Pinot Grigio soaked apples back in! Cheers! The hardest part of this recipe is waiting for it. Because it’s really as simple as combining the first 8 ingredients (everything but the ginger ale) in a pitcher. Then cover with plastic wrap and place in the fridge for 4 hours. If you don’t mind a few spices bobbing around your drink, fill glasses with 4 ounces of your sangria mix, and top with ginger ale and your favorite straw. For those who prefer a less cluttered cocktail, strain out the spices through a sieve. But don’t forget to drop those delicious Barefoot Pinot Grigio soaked apples back in! Cheers!